The Food Advisory Committee Emory (FACE) discussed changes to dining at Emory, including new online ordering opportunities for the Cox Hall Bridge Farmers Market, updates on the new Eagle Convenience and Subs store in the Dobbs University Center (DUC), discounts at Dobbs Market and dining improvements at Woodruff’s WReC Room and the Clairmont Campus during its monthly town hall dinner. Among the updates at the most recent meeting, FACE, a student-run organization, announced a new sustainability initiative in partnership with the weekly Farmers Market on the Cox Hall Bridge as part of FACE’s commitment to local produce, sustainability and convenience. According to Vice President of Sustainability and College junior Hannah Dugoni, FACE is working towards setting up a website through which students can sign up and pay a one-time flat fee for a box of food from the farmer’s market every week. Students will be able to specify which local fruits and vegetables they want to order through the online system. The first trial will involve 20 students and will take place on a first-come-first-served basis, according to Dugoni. 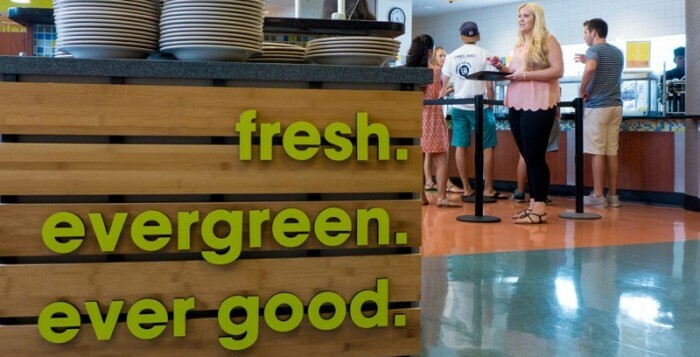 Among the other updates, the Dobbs Market will offer special rates for upperclassmen who do not have meal swipes, Senior Director of the Food Service Administration (FSA) Dave Furhman said. In conjunction with the five percent discount that students receive for using Dooley Dollars, students will pay $6 for breakfast, $7 for lunch and $10 for dinner. FACE also updated students on the introduction of healthier foods such as omelets and grilled chicken to the Student Activity & Academic Center (SAAC) at Clairmont Campus. Paper bags have also been introduced at the WReC Room so that students can more easily carry their food around. Students also voiced concern about various issues with dining around campus. Furhman added that liquid eggs are often of “better quality” than shelled eggs and that packaged eggs are used for practical purposes, such as to meet the volume of demand for omelets. Students in attendance at the meeting also voiced concern over the current structure of some of the meal plans. An upperclassman, who refused to disclose his name, suggested more intermediate options for student meal plans, as purchasing a more expensive meal plan leads to more Dooley Dollars but not enough meal swipes. Furhman responded that FACE would work on the issue and recommended that students with similar concerns attend the Nov. 6 town hall meeting. FACE updated students on the construction of the Eagle Convenience and Subs store on the first floor of the DUC. The new convenience store, which will open on Oct. 15, will have hours from 8 a.m. to midnight Monday to Friday and the sub shop hours will be 11 a.m. to midnight, Monday to Friday. Weekend opening hours are still being determined. The convenience store is being built due to a need for convenience for students who do not own cars, Retail Representative and College junior Sabrina Huang said. Currently, the CVS Pharmacy at Emory Village is too far to meet the daily needs of students, according to Huang. Huang added that the sub-shop idea was implemented to give students more options for late-night dining. The convenience store will also sell Emory-related sweatshirts and mugs, and prices will be comparable to that of a regular convenience store, Huang said. Co-Chair of FACE and College junior Molly Talman said that while Eagle Convenience and Subs will accept both Dooley and Eagle dollars, but meal swipes cannot be used. H&F Bread Company and Boar’s Head Deli will be serving at the sub shop. Many students who attended the meeting found it informative. College freshman Robert Gershowitz, who attended a town hall for the first time, was impressed by the meeting. “I didn’t realize they took so much student feedback,” he said. “FACE is designed as one of several means for members of our community to provide feedback about any aspect of campus dining or to provide suggestions for improvement,” Furhman wrote in an email to the Wheel. Talman recommended students who want to get involved should join FACE’s focus groups, which are open to all and discuss specific dining locations. FACE aims to bring together Emory students and Emory Dining staff and hosts monthly town hall meetings in which they discuss and implement students’ suggestions. The next town hall meeting will take place on Nov. 6.